These 3 adorable boys were taken in by a police officer. A woman, who was living out of her car with over 10 dogs, was trying to sell these pups as "purebred bulldogs". The officer convinced the woman to surrender 3 of the 6 pups to him where they could be immediately taken to the safety of a home. Mind you, it's over 100 degrees right now, and being confined to a car is no way for a dog to live. After the 3 boys were placed in foster care with us, the wonderful officer went back to look for the woman in an attempt to rescue the rest of the pups and work with her on proper pet care. Unfortunately, he did not have any luck getting any of the other dogs surrendered, and the only lawful thing the animal control could do was issue a few tickets and citations. The officer, animal control, and Fresno Bully Rescue are all still actively working together to help the woman and her dogs. The boys were such well-mannered house guests and we enjoyed every moment we were lucky enough to spend with them. 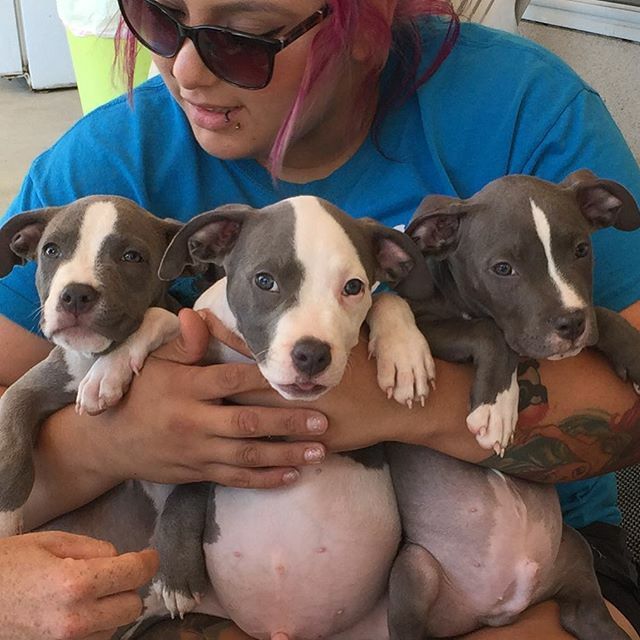 All 3 pups have been adopted into their furever homes, and you can even continue to watch Corey (now named Mako) grow on Instagram at @Mako_Pibbles. We thank you all so much for your continued support and are excited to see what the future holds for us!